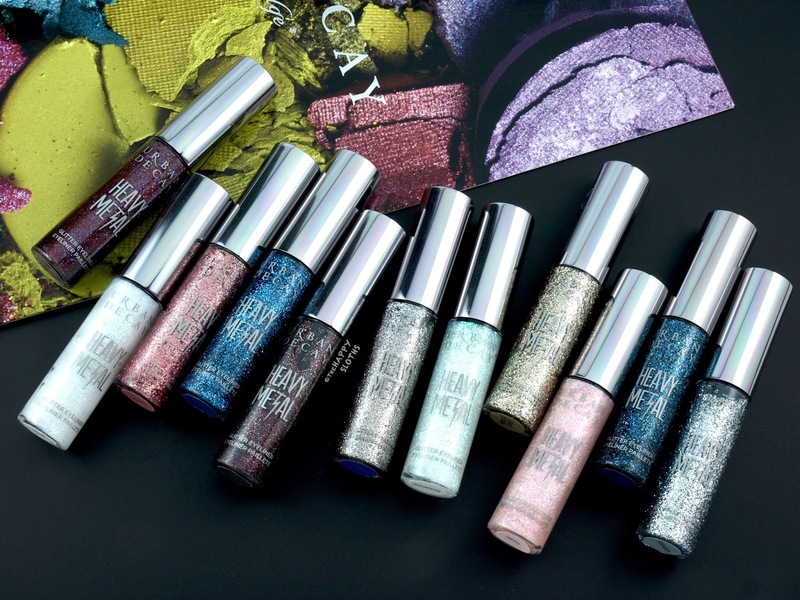 The Urban Decay Heavy Metal Glitter Eyeliners are packaged in a clear plastic lipgloss tube paired with a sleek gunmetal cap. The underside of the cap is attached to a teeny tiny bristle applicator. The tip is very fine so you can achieve a precise application but the brush itself is also very small, making it difficult to pick up a decent amount of glitters. 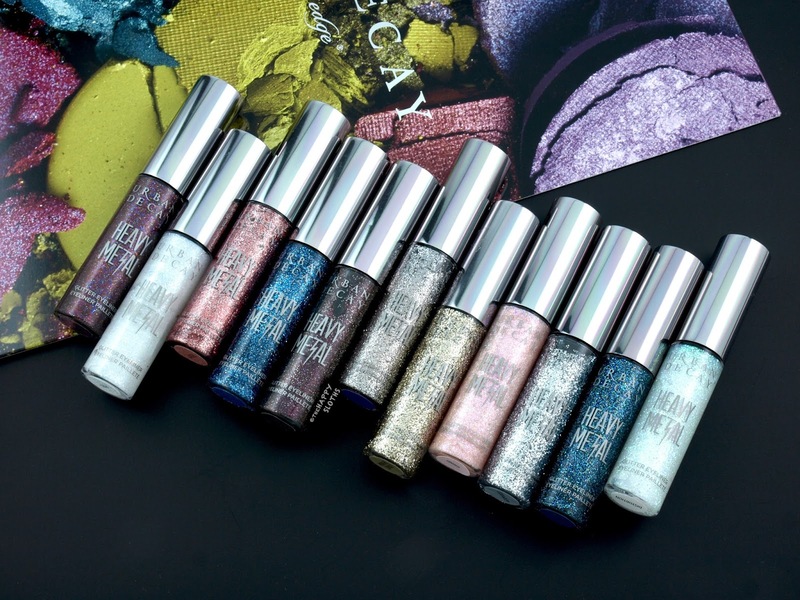 The Heavy Metal glitter liners are available in 13 shades, all of which are suspended in a clear or slightly tinted translucent base. The formulation is smooth and easily spreadable; it contains a good amount of very fine glitters but it's not opaque enough to draw a solid line. Additionally, the drying time can be quite long so it's best not to apply too thick of a layer. 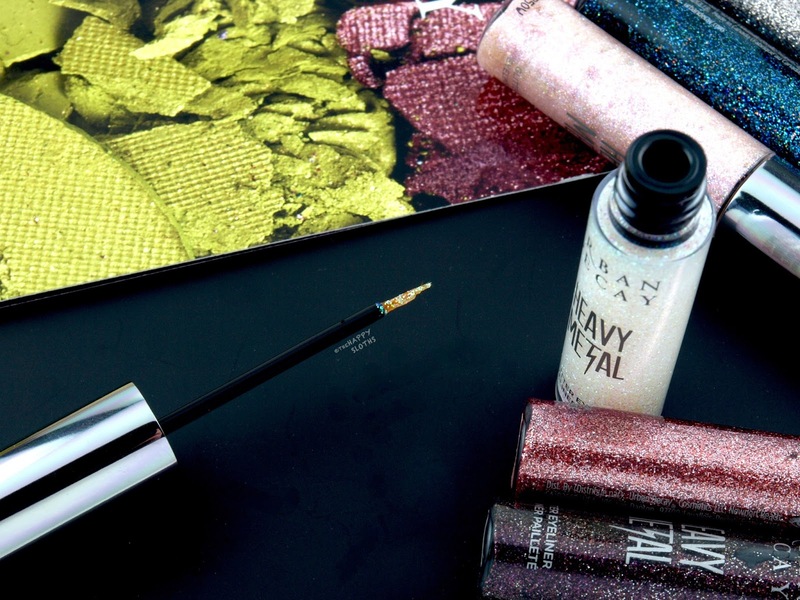 After the liner is completely set, the clear base virtually evaporates, leaving behind the slightly gritty texture of the glitters. 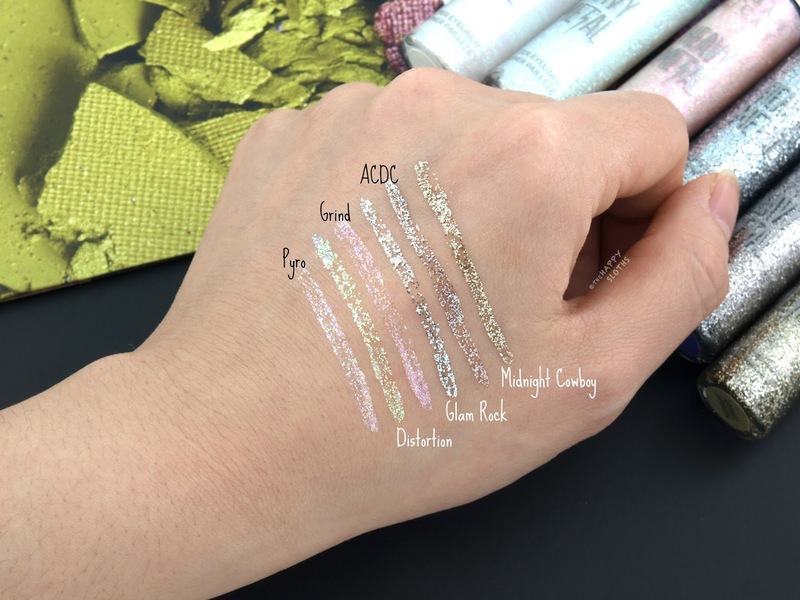 These liners are pretty smudge-proof but the glitters might transfer or fall off when rubbed. Additionally, because the formulation is water-based, it is not waterproof. See below for a breakdown of the individual shades. Pyro: With iridescent glitters and iridescent shimmers, this liner shifts between shades of pink, lavender, orange, and teal. Distortion: This is a simple iridescent glitter that shifts between blue, green, and pink. Grind: A pinker version of Pyro, Grind is a combination of iridescent glitters and shimmers. Glam Rock: This is a basic silver glitter. ACDC: Described as a bright purple glitter, ACDC is actually a silver and brown glitter suspended in a very sheer purple base. Midnight Cowboy: Made with silver and gold glitters, Midnight Cowboy is suspended in a clear base. Catcall: Suspended in a sheer pink base, Catcall is made with pink and silver glitters with an added splash of golden shimmers. Punk Rock: With a brownish base thanks to its fine brown shimmers, Punk Rock contains iridescent glitters that shift between lavender, orange, and green. Stix and Bones: This is a black-based liner scattered with silver and blue glitters. The formulation also contains an iridescent maroon shimmer. Gamma Ray: With blue and iridescent glitters, Gamma Ray is suspended in a clear base. Spandex: This is essentially the same shade as Gamma Ray, with the exception of some added black shimmers which give the appearance of a black-tinted base. 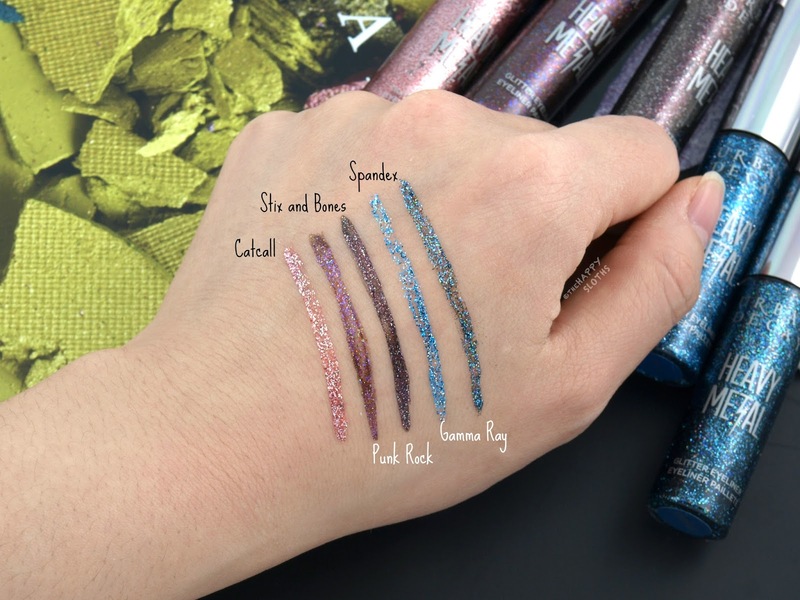 Overall, this is a very pretty range of glitter eyeliners. I like how fine the glitters and shimmers are but the formulation could be a little more opaque. The liners would be great for providing some glitter accents to your eye makeup but they are a too sheer to be used in place of a regular liquid eyeliner.